Grain, or more accurately dependence on grain, is what separated farmers from foragers, Jacob from Esau. Grains underpin civilization: portable, easily renewable, nutritionally dense foods that can be grown in surplus and stored — or kept from those the holder deems unworthy. Holly bands doves for the state fish and wildlife department. To do so, she is given bags of mixed grain to bait them into a live trap, so she can capture the doves, band them and let them go. Apparently doves vastly prefer safflower to wheat, because when the rains came in October this past year, it was wheat that began to grow in our yard. Lots of it. I gathered a mess of green wheat and set the sheaves on a steel plate. To make farik, you then set them on fire briefly to burn away the little spikes on the grain heads, and to parch the seeds a bit. You then let all this dry in the sun for a day or two, which makes it far easier to thresh and winnow your wheat — literally separating the wheat from the chaff. 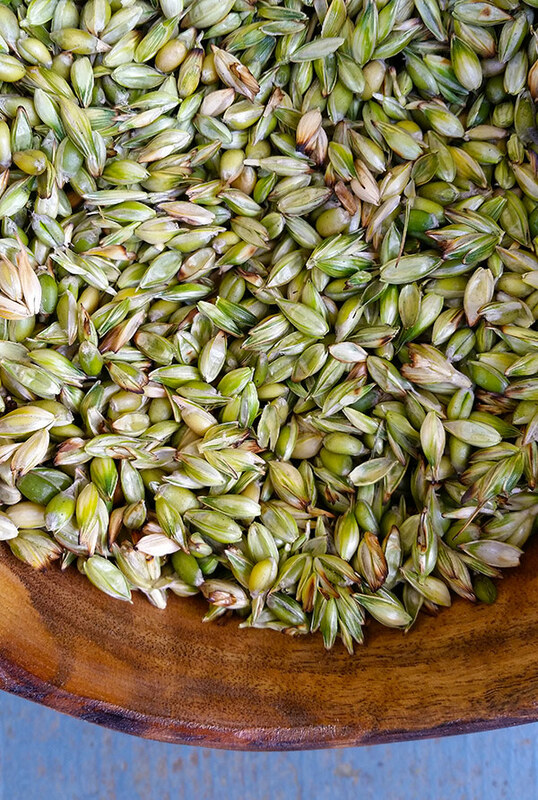 What you get are greenish-tan wheat seeds that cook up faster than fully ripe wheat berries, as the seeds are called, and green wheat tastes a little more grassy than when it is fully ripened. A few weeks later, all the wheat had dried. I collected what there was in a basket and set to see what it would have been like to harvest wheat before the dawn of agriculture. So OK, I am aware that before the dawn of agriculture, wheat seeds spontaneously popped off the grain head, flew through the air a few feet from the parent plant. This is what most wild grains do today. And yes, there is still wild wheat in places like eastern Turkey. 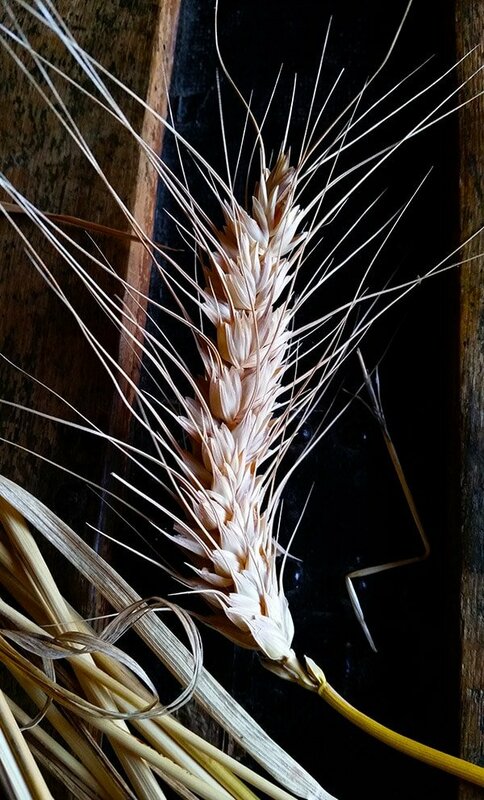 My wheat was kind enough to hold onto its seeds until I got around to threshing. We did that. 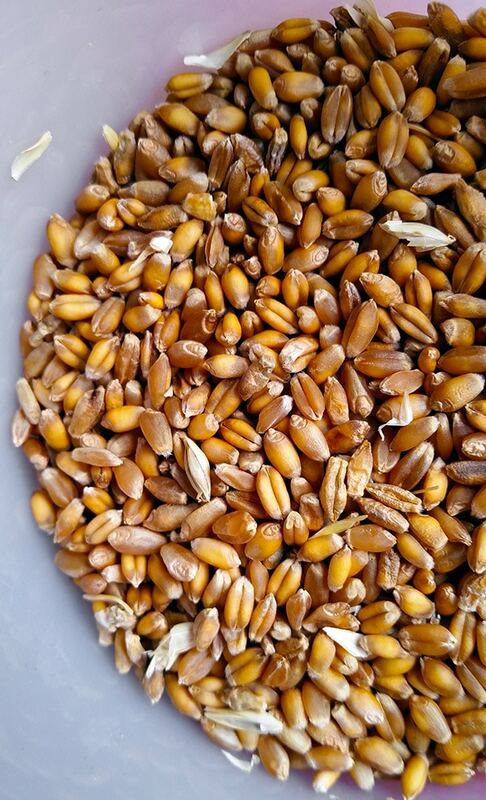 A certain, set percentage of wild wheat in a field will hold its seeds. A disadvantage, evolutionarily speaking. But when our ancestors discovered this, they kept replanting those disadvantaged plants so they can later harvest whole heads. Disadvantage became advantage, thanks to us. Threshing. Such a pain! I understand now why gatherers didn’t make grain the backbone of their diet. A grain of wheat sits inside the head, inside chaff. You need to get rid of all that before you can sit down to a bowl of Wheaties. Getting the seeds off the head wasn’t terribly hard. 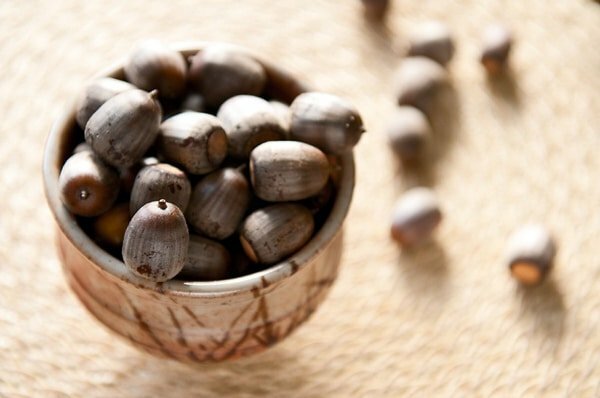 You strip them from bottom to top with your hand, letting them fall into a basket. Always bottom to top, because of the nasty spikes on each grain, which will stick you if you go the wrong way; it’s like petting a cat backwards. Not good. Then you’re left with a bowl of wheat surrounded by chaff. What now? Well, the good news is that the actual wheat is as hard as a rock, so you can be a little more energetic with it than you could with the green stuff. Mostly I just grabbed a handful of seeds and rubbed them in between my palms, which separated the wheat from the chaff; all this fell into a bowl. The problem with this method, as some human learned about an hour into this process some 20,000 years ago, is that the chaff is abrasive enough to cut up your palms ever-so-slightly. So that’s out. I’ve seen people put all the seeds into a sack and beat the daylights out of it, but I didn’t have all that much. So I used a trick I learned with pine nuts: I put all the seeds on a terrycloth towel, covered it with another terrycloth towel, and then used a rolling pin to roll over everything. The spiky, abrasive chaff sticks to the terrycloth, and the seeds are easily poured out. I am certain there are better ways to do this. But think about it: In the beginning, all those thousands of years ago, this would have been how it all started. By hand. Using rocks and sticks and such. No wonder each grain of wheat was held as a sacred thing. I found myself going over the chaff by hand, making sure I did not miss a single precious seed. Winnowing was actually kinda fun. I used a bowl with sloping sides, and sat on my back step sitting in the breeze. Jiggle the bowl and the heavier seeds drop to the bottom. Blow on the top in just the right way and you blow off only the chaff. Over and over and over and over you do this, until, at the end, you are left with a bowl of seeds. Seeing this transformation happen bit by bit, breath by breath, kicked in something hard-wired in me: This was food. This was life. I ended up with two cups of green wheat, and two cups of fully ripe wheat. A pittance, especially considering that it took several hours to harvest, thresh and winnow. But was it? Think again. Two cups of wheat is about 1500 calories, a day’s worth of iron and a third of the calcium you need in a day. What’s more, those two cups provide 72 grams of protein, 16 grams more than a grown man like myself would need in a day. Now know that harvesting grain is not a linear activity. It only takes a marginally longer time to thresh and winnow ten or even 100 times the amount of wheat I grew, especially when you get better at it. Starting to see why grains became so seductive to our ancestors? A small sack of wheat berries, carried on my belt or in a backpack, could sustain me for days as I hunted for a gazelle out on the plains of the Fertile Crescent. Grain is powerful food in a tiny package. But there is one problem with this scenario: The very indestructibility of those grains of wheat make them time-consuming to cook. It’s not uncommon for whole wheat or rye berries to require two hours or more on the boil to become tender; mine took about 90 minutes to soften to the point where they had a pleasing pop, but were tender inside. So? Well… ever been camping? Ever sit at a fire tending something for two hours? Not so fun, unless it’s a big hunk of deer or somesuch. Enter flour, or at least grits. 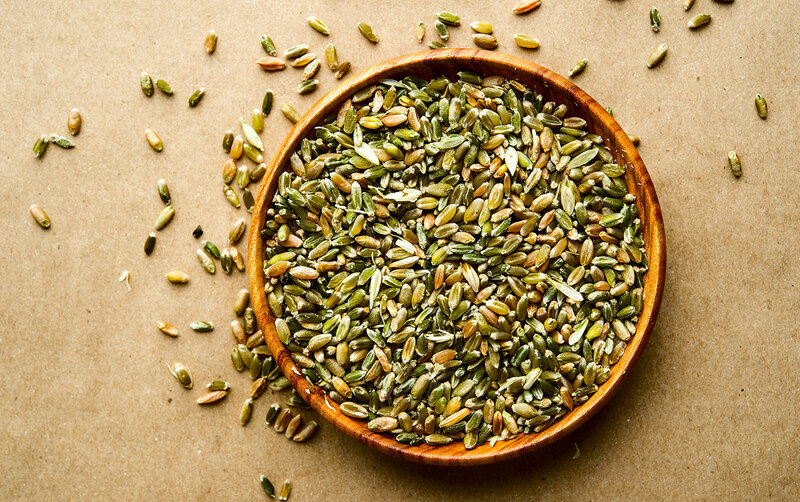 Crack these dried wheat berries and they will cook up twice as fast. Grind to grits and they’ll be ready in about 30 minutes. Grind to a flour and you can make a flatbread in minutes. When you realize that fuel and time drove this, more than flavor — I happen to love cooked whole grains — you start to see where grains started to become more and more marginalized in our collective consciousness. We now live in a world of debased grains fed to an indifferent people. GMO corn. Wheats bred for yield, not flavor. Hyper, steroidal yeasts that do for our daily bread in minutes what should take hours. Rice stripped of its life force — do 88 souls live in each grain of Uncle Ben’s? Fortunately there are glimmers of hope out there. It began, interestingly enough, in the South, with chefs such as Sean Brock, Linton Hopkins and Chris Hastings demanding honest-to-God stone-ground, real-deal, heirloom grits. Now no serious Southern chef would ever serve industrial grits. Other grains are following. Some of the finest rice in the world is grown where I hunt ducks in winter, north of Sacramento. And more and more Midwestern farmers are turning to ancient grains, such as emmer or spelt or the oldest of them all, einkorn wheat. 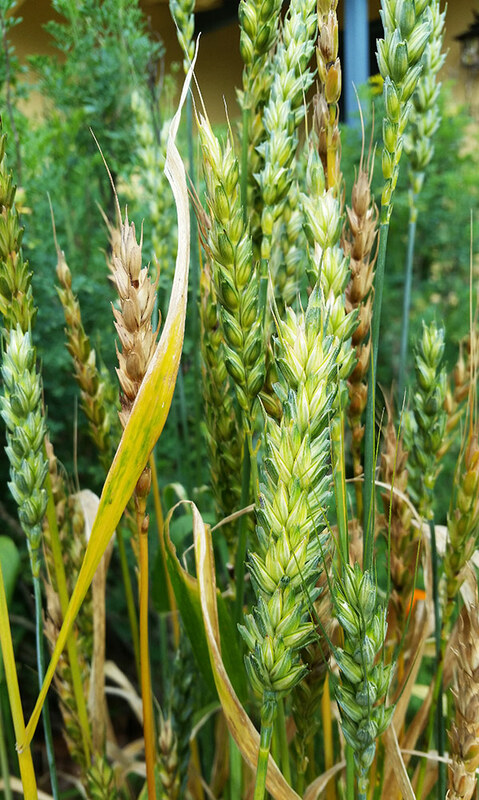 Interestingly, rye and barley and oats have been so marginal to us for so long that they never went through nearly the metamorphosis that wheat and corn and rice did. They remain largely as they were millennia ago. Just as it is with cured meats — you can’t make great salami with inferior pork — you can’t make truly great bread with crappy wheat. And even moreso that with meats, a perfect loaf of bread is evidence of ancient alchemy. A touchstone to ten thousand of years of tradition. It, along with a perfectly made beer, are celebrations of grain that have no equal. Stop for a moment and imagine that loaf of bread, only this time baked with your own wheat. Washed down with a homemade hefeweizen. Imagine the care you’d put into it, knowing where every grain of wheat came from. It’s a crazy notion, even for me. But still… Next time you go to the market, consider that grain of wheat, or barley, rice, rye, millet or corn. Consider where it has taken us, where we are now, and where we might go from here. We did a video of this whole wheat experiment here. Hope you like it! Yep, really puts things in perspective when you have a go at it yourself. I have 2 kgs of barley I’ve grown myself that im adding to slowly before I attempt to malt it. Add my home grown chinook hops and some rain water and.. wow.. I may just finally be able to produce a truly single origin suburban beer. Although when I get to that point, I somehow doubt ill be going the wild yeast route after all that work.. split batch maybe? Cheers Hank, thought for food. Great read! As a boy, when we’d sow Abruzzi rye for winter grazing for the cattle herd, I always looked forward to the formation of the seed heads to chew on! Thank you Hank. Your writing is touching a chord in me. I love what you are doing. Keep it up! I love this. I actually planted a small patch of wheat this year out of curiosity. I’m so excited to harvest it this fall. Though the rain has ruined a large portion of it already, I’m hoping some will pull through.